The Global Partnership Award is an opportunity to recognize an outstanding partnership that has gone above and beyond expectations and reflects the core values of partnership. The award winner will be selected annually by the Global Partners in Care Advisory Council. Partnerships are only as strong as the commitment of the two organizations involved. 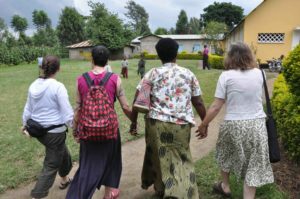 The Global Partners in Care partnership program strives to create and support mutually beneficial, sustainable relationships between US and international hospice/palliative care programs. Our Global Partnership Award recognizes the exemplary work of one partnership that has demonstrated leadership, innovation and has significantly contributed to the sustainable development of hospice and palliative care through their Global Partners in Care partnership. Each partnership is automatically considered for the award. The Global Partners in Care staff and Advisory Council will consider the activities and engagement of partners in selecting the recipient. Learn more about the past award recipients.